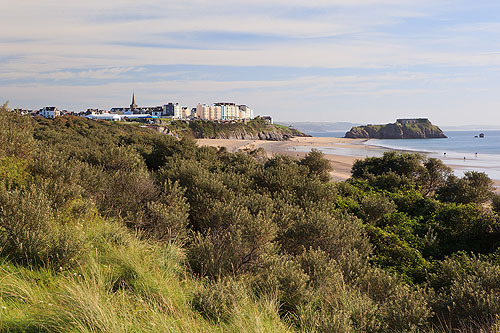 Large areas of the Sand Dunes , behind Tenby South Beach are covered in Sea Buckthorn - "Hippophae Rhamnoides". A deciduous Shrub / Small Tree with bright orange berries in the Autumn. It is largely confined to sea coasts where salt spray off the sea prevents other larger plants from out-competing it. It forms dense thickets with thorny twigs . The female plants produce orange berry- like fruit , the berries are edible , but very tart when eaten raw.